And then we turn to Facebook to find out what’s going on with friends and family across the globe. We laugh. We gossip. We share photos of social events, barely giving a thought to what they look like from the outside. It’s a mindset that could be fatal for your career. Facebook is, after all a “social” networking site. It’s built on the premise that sharing is good, and more sharing is better. And it does little to protect us from ourselves. 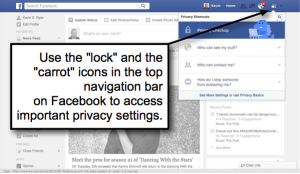 Use the lock button to access Facebook privacy settings. So it should come as no surprise that aspects of your profile are always public. The fact that you have an account is public (assuming you use your real name, which is something Facebook requires). Your profile picture is always public. That large “cover photo” on the top of your profile page is public. And so are many of the updates – words, pictures and videos – you’ve shared through the years. Not only that, the things you say on company pages are public – and indexed by the search engines. And in many cases, your friends list is public, too. Which brings us to this: Recruiters, business partners, and potential customers may be looking at the public content on your Facebook profile page. Right now. All they need to do is type your name in the search box to find it. The latest Jobvite Social Recruiting Survey says that 93% of recruiters review a candidate’s social media profiles before making a hiring decision. More than half (55%) say they have reconsidered candidates after looking at those profiles. And 35% say they look at a candidate’s Facebook profile after an interview. 1. Get to Know the Privacy Button. Dig deep into “Who can see my stuff,” paying specific attention to the option that says “What do other people see on my timeline?” This selection reveals what total strangers (and recruiters!) see when they look at your profile page. You might be surprised by what’s there. 2. Clean Up Your History. If you’ve had Facebook a long time, you’ve got a lot of history there. Facebook saves everything, and people looking at your page can scroll and scroll and scroll until they run out of time. Fortunately, Facebook allows us to limit the visibility of this history so that only friends can see it. Unfortunately, it takes some work to do. In this case, you’ll want to click on the little triangle “carrot” icon in the top right corner of the navigation bar. Look for “Settings” in the drop-down menu, and then click on “Privacy” in the left navigation. Yes, that’s a mouthful. And yes, they will give you a warning that says “this can’t be undone.” Do it anyway. When you do, all of your old posts will be marked as “friends only,” meaning they won’t be visible to people you don’t know. 3. Take Charge of Tagging. Tagging is a big deal on Facebook, allowing your friends to mention you in posts or identify you in photos. Those tags get your attention but they also create content that might be visible (even to outsiders) on your profile page. Unfortunately, there is no way to stop people from tagging you on Facebook. But you can always remove a tag after it’s been published. And you can determine whether that tagged content shows up on your profile page. To do this, go back to the “carrot” icon in the top right corner of the navigation bar. Click on the “Settings” link in the drop-down menu, and then click on “Timeline and Tagging” in the left navigation. Look for the section that says “Review posts friends tag you in before they appear on your timeline.” When you enable this feature, tagged content does not show up on your page until you say it’s OK. Again, this doesn’t stop tagging altogether. But it does prevent potentially embarrassing content from showing up on your page before you review it. Now that you’ve cleaned up your history and taken charge of tagging, start to think about the kinds of content you want people to see when they go to your page. Yes, Facebook is about friends and family, our candid observations about daily life. But if outsiders are looking at our profiles, it makes sense to manage what they see. Update your profile picture so that it matches the photo on your LinkedIn account. This ensures that recruiters or business partners know which profile is yours (especially important if you have a common name). 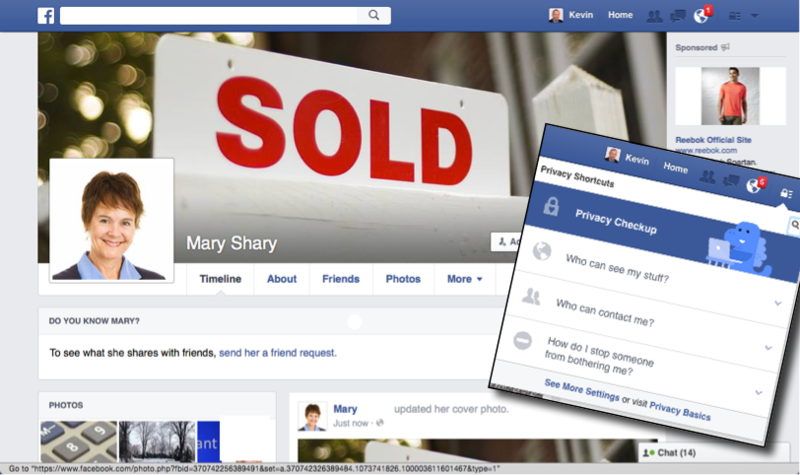 Add a cover photo that reinforces your professional identity – a “sold” sign if you’re in real estate, a 1040 form if you’re a tax accountant, etc. And add content – status updates, infographics, links to relevant professional content – that show you are up-to-date with your industry. It’s the same content you might post to LinkedIn, but you do it on Facebook – occasionally – so that people checking you out there are impressed with what they see. Every time you post something to Facebook, you determine who gets to see it. The primary settings are “Public,” which means that anyone can see it, or “Friends,” which limits initial visibility to your Facebook friends. There’s no default setting for this. It changes according to what you did the last time. So if your most recent post was Public, your next post will be Public, too – unless you deliberately change it to Friends. Always look at the “visibility” menu in the create-a-message window to determine who’s going to see your next message. And be smart about what you post.